Stefanou, Maria Ioanna 2018. The footprints of neuroscience in Alexandria during the 3rd-century BC: Herophilus and Erasistratus. Journal of Medical Biography, p. 096777201878934. Kehoe, Dennis 2018. A Companion to the City of Rome. p. 443. Long, Leah E. 2017. Extracting economics from Roman marble quarries†. The Economic History Review, Vol. 70, Issue. 1, p. 52. Blouin, Katherine 2017. Beyond the Nile: Orientalism, environmental history, and ancient Egypt's Mareotide (northwestern Nile Delta). History Compass, Vol. 15, Issue. 10, p. e12397. Müller, Matthias 2016. Among the Priests of Elephantine Island Elephantine Island Seen from Egyptian Sources. Die Welt des Orients, Vol. 46, Issue. 2, p. 213. Gorre, Gilles 2015. The Encyclopedia of Ancient History. p. 1. 2014. Economic Theory and the Ancient Mediterranean. p. 120. Fischer-Bovet, Christelle 2013. EGYPTIAN WARRIORS: THE MACHIMOI OF HERODOTUS AND THE PTOLEMAIC ARMY. The Classical Quarterly, Vol. 63, Issue. 01, p. 209. Goodrich, John K. 2010. Guardians, not Taskmasters: The Cultural Resonances of Paul’s Metaphor in Galatians 4.1-2. Journal for the Study of the New Testament, Vol. 32, Issue. 3, p. 251. 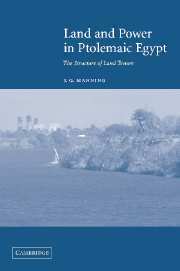 This history of land tenure under the Ptolemies explores the relationship between the new Ptolemaic state and the ancient traditions of landholding and tenure. Departing from the traditional emphasis on the Fayyum, it offers a coherent framework for understanding the structure of the Ptolemaic state, and thus of the economy as a whole. Drawing on both Greek and demotic papyri, as well as hieroglyphic inscriptions and theories taken from the social sciences, Professor Manning argues that the traditional central state 'despotic' model of the Egyptian economy is insufficient. The result is a subtler picture of the complex relationship between the demands of the new state and the ancient, locally organized social structure of Egypt. By revealing the dynamics between central and local power in Egypt, the book shows that Ptolemaic economic power ultimately shaped Roman Egyptian social and economic institutions.